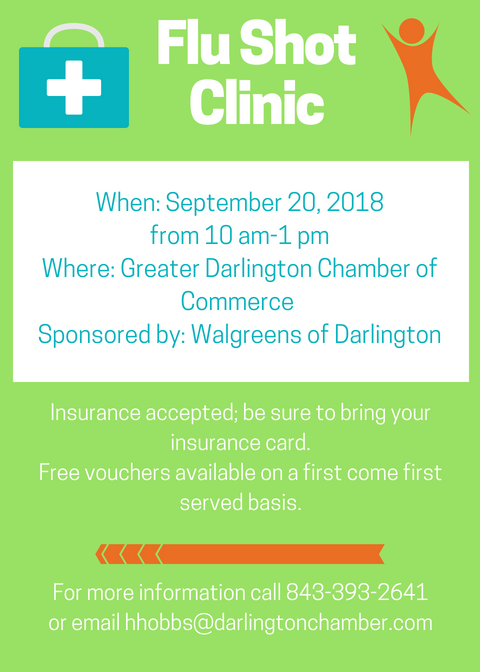 Join the Greater Darlington Chamber of Commerce for a Flu Shot Health Clinic on September 20 from 10 am – 1 pm at the Chamber, sponsored by Walgreens of Darlington. This is a great opportunity to get your flu shot that may prevent you from getting sick. Insurance is accepted, so be sure to bring your insurance card to file. For those without insurance, a limited amount of free vouchers will be available on a first come first served basis. The Greater Darlington Chamber of Commerce is located at 38 Public Square in Darlington. For more information call 843-393-2641 or email hhobbs@darlingtonchamber.com. See you there!